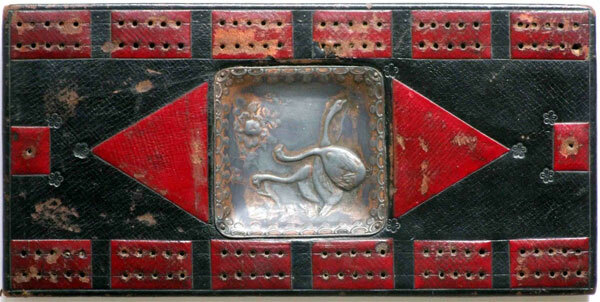 There are a great many varieties of Cribbage boards made from leather. 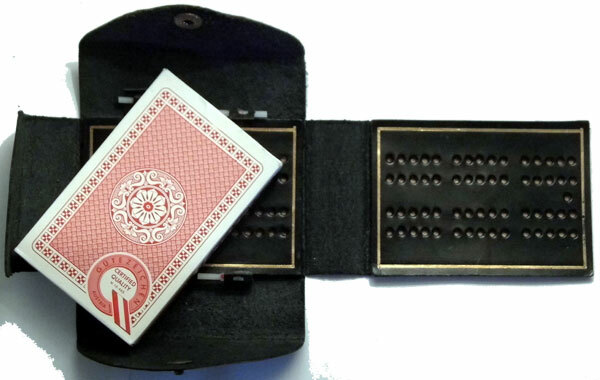 This includes the tiny travel version (left), complete with metal pegs and recorded by the American Cribbage board guru, Bette L. Bemis, as being used by soldiers in WW1. Also, one of my favourites is probably at least WW2 vintage and may even itself date from WW1. Above: elaborate example (complete with central ash tray), almost certainly Anglo-Indian, probably dating from the 1920s. From the collection of Tony Hall. 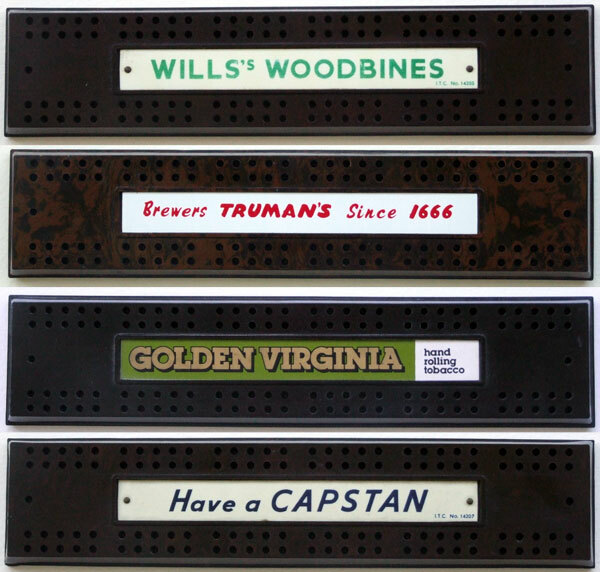 Above: Bakelite was much used from the 1940s/50s and one standard model was used by a wide variety of tobacco brands. 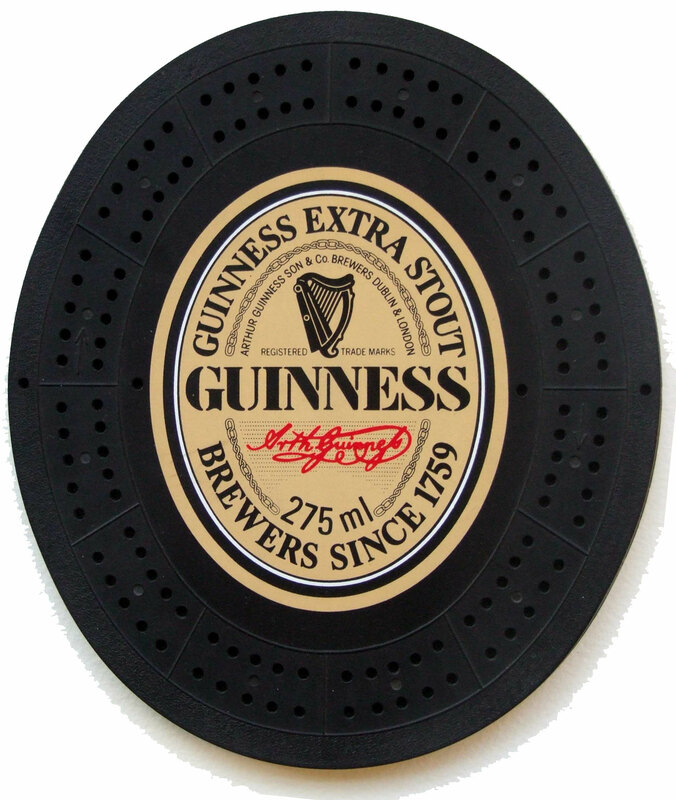 Some used other materials such as Perspex or wood (below). Others still were more elaborate with double card or domino boxes (left). The smallest in my collection is in the form of a key ring advertising Jasper Park, Canada. Above: From the collection of Tony Hall. 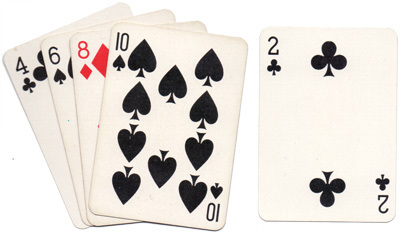 Above: The four card hand comprises a “double run”, always worth 8 points, that is two runs of 2,3 and 4 each worth three points, and two for the pair. 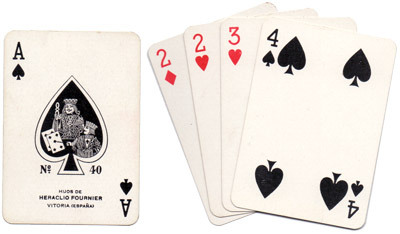 As the up-turned card is an Ace the five card hand constitutes “a double run and one” (each run is now of four cards) – always worth 10 points, and more if any of the combination of cards add up to 15. 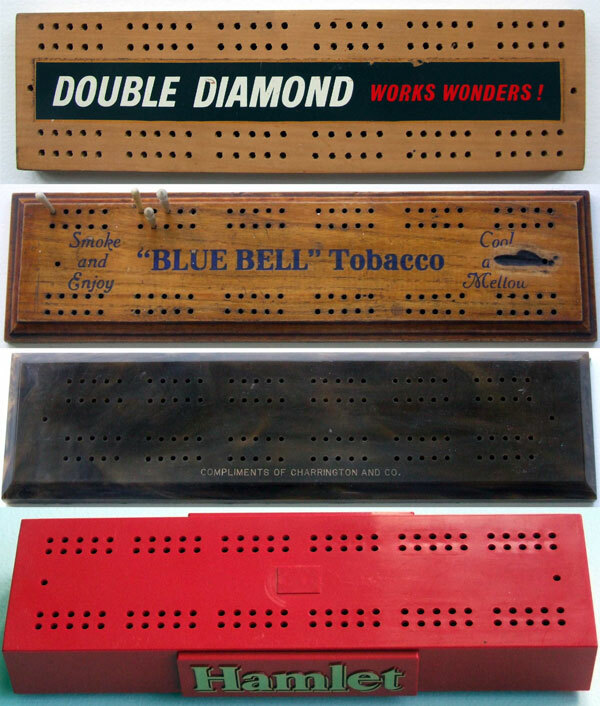 There have been many attempts in more modern boards to move away from the traditional scoring shape of 30 hole parallel tracks. The most common of these are the varying types of continuous track. Probably the earliest in my collection is a Drueke “Club Master” board, no.1957 made in the USA in the 1950s/60s. But others abound, and range from the reasonably small to a much larger range catering for three or four players. 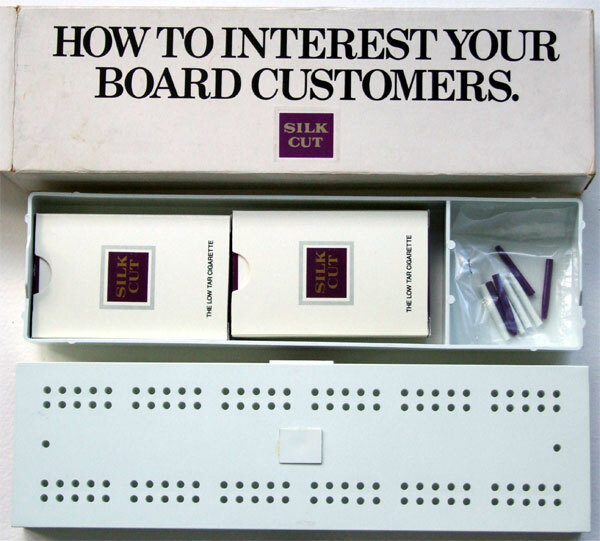 Alternately, you can play on a long track China-made board, with 60 holes in each track length. Above: this hand looked promising before the fifth card was cut from the pack, but even with that is worth absolutely nothing – no 15s, no runs and no pairs!